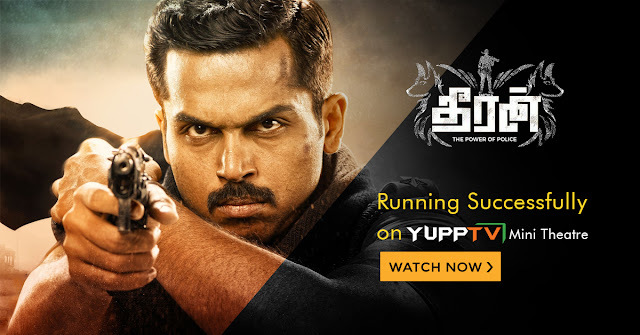 The recent sensation depicting a real Police Story Theeran Adhigaaram Ondru casting Karthi as the lead actor and Rakul Preet Singh as the lead actress, is now available at YuppTV Mini Theatre. The film which is written and directed by H Vinoth is the product of the director’s close work with Mr.S R Jangid. Mr.Jangid had been the Consultant for the film. He is the Inspector General who had led the team that brought down the notorious Bawaria Gang, the case on which the movie’s plot is based on. The Gang which raised a dread among the houses that stood by the National Highways of Tamil Nadu, Karnataka, and Andhra Pradesh was one of the sensations of the time. The story of the film Theeran Adhigaaram Ondru depicts the “Operation Bawaria Dacoity” that the Tamil Nadu Police has executed to catch the dacoits. Karthi who is the lead actor in the film, delivered an ultra realistic performance to keep the audience glued to the screens all through the length of the film. The film is remarkably pragmatic and gave the audience a fresh feel with its narrative style. The depiction of the events without disrupting the facts in any way is another reason for the film’s success. It was praised by the audience and the critics alike and has received the highest ratings from the top rating magazines and websites of India. This movie is now available on YuppTV Mini Theatre to watch from anywhere in the world in HD quality. It is watchable at your convenience for a meager price. The movie will be available for 24 hours after the purchase. Catch the latest Tamil film Theeran Adhigaram Ondru on YuppTV Mini Theatre Now.